I like it….it has me somewhat satisfied, at the moment. I think I am going to make a couple minor cosmetic changes to it. I want to distress some of the newly painted sections a bit. The contrast is a little more than I care for on this piece. Plus I might even distress the louvers some more. But all that can come with time. I am pleased that it can hold a lot and still have a bit of room to spare. Now my next challenge is to actually make sure these girls put stuff away when they go indoors for the night. In the end of it all, I am happy that I was able to use up some of my clutter, again, to make something functional for us to use. I hate that I let it affect me the way it did; ridiculous writing, hopefully not many of you read my mess, and ranting over a project. 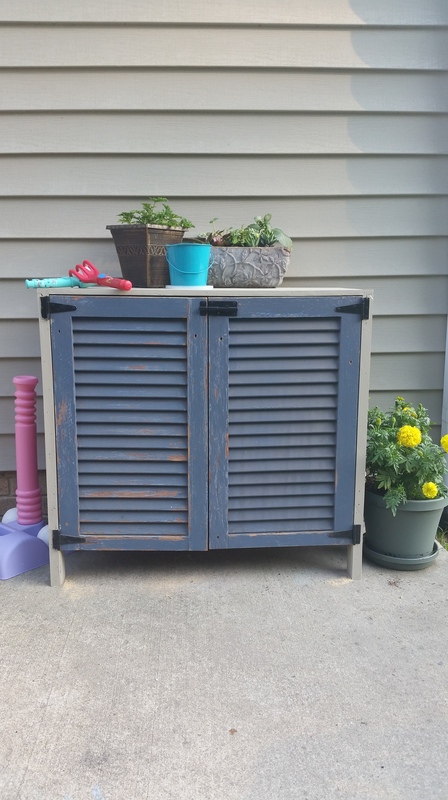 But in the end, I am mostly happy that these shutters are getting a new life. They are just too pretty to me to just toss in the garbage.